Coda Octopus Martech is pleased to announce the successful completion of its first sales and installation training day for the Fire Sprinkler Pump Watchdog product, at VIKING Fire Protection’s Tipton offices. Whenever a pump is not used regularly, there is a high risk that it will become seized and then it will not run when required in an emergency. 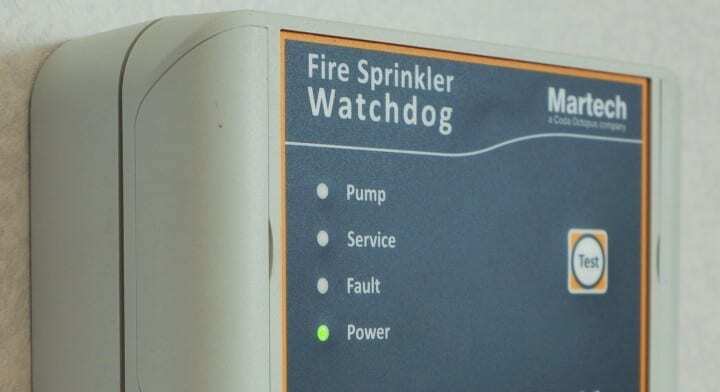 Martech’s Watchdog is a low cost, simple solution that will integrate into any single-phase pumped sprinkler system to ensure the pump is operational when it matters most. Designed to comply with new legislation that started to come into force earlier this year, and with BS9251:2014, the Martech Fire Sprinkler Pump Watchdog meets the latest requirements for domestic pumped sprinkler system integrity and maintenance. Incorporating micro-processor control, the watchdog performs an automatic periodic pump test, checking for pump failures and providing a routine maintenance reminder. Copyright © 2013 Coda Octopus Martech. All rights reserved.